In 2019, Cleveland Public Library celebrates 150 years of service to the city of Cleveland. Under the leadership of Director Felton Thomas, Jr., the Library has rapidly evolved to meet the changing needs of the Cleveland community. But now, Thomas is looking forward and evaluating the role Cleveland Public Library plays in the fabric of a vibrant city. As such, the Library announced today additions to its leadership team to shepherd the organization into the future. Since early in 2017, Director Thomas and Cleveland Public Library Deputy Director and Chief of Staff Tena Wilson have been thoughtfully recruiting top industry professionals to round out its leadership team. 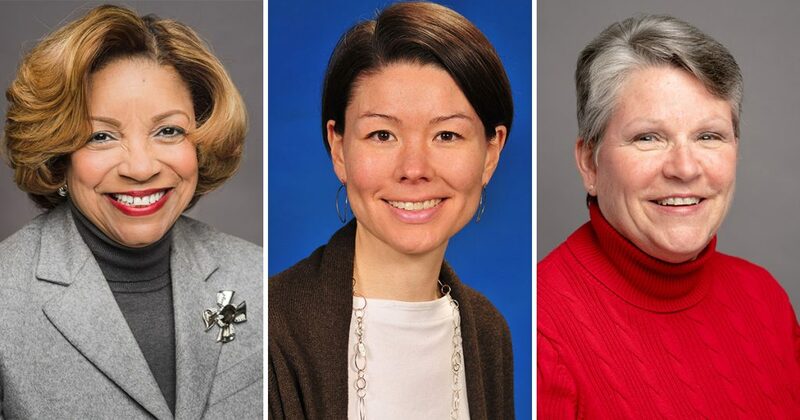 Joining the executive team, effective mid-January, are Lynn Sargi, Chief Talent Officer; Tana K. Peckham, Chief Marketing & Communications Officer; and Sadie Winlock, Director of Equity & Inclusion Initiatives. Sargi, who most recently was Director of Human Resources for Summit County Board of Developmental Disabilities, brings 25 years of human resource experience. She has extensive experience in implementing best practices and process improvements in talent acquisition, employee relations, and organizational development. Peckham, was recruited from Nestlé USA. A 15-year marketing veteran whose career started in the non-profit sector, Peckham has experience launching multi-channel marketing campaigns like Made for You to Love for the Stouffer’s brand in 2016 and advising brands from Nestlé Toll House, to Hot Pockets, and DiGiorno Pizza, on their brand strategy and communications campaigns. Winlock was most recently the Chief Executive Officer for the Akron Urban League. She joins the Library with over 30 years of both corporate and nonprofit experience in leadership and program development. As CEO of the Akron Urban League, Winlock was instrumental in expanding the organization’s capacity in fund development, educational and professional skills training as well as effectively engaging the community-at-large in diversity and inclusion conversations. These recent additions join Thomas, Wilson, and the rest of the leadership team, who successfully navigated a levy campaign to support Cleveland Public Library and earned a Five-Star Library status by the Library Journal for the fifth year in a row. The Library leaders will join Director Thomas when he delivers his State of the Library on Wednesday, February 27 at the City Club of Cleveland and speaks to the future vision of the organization.